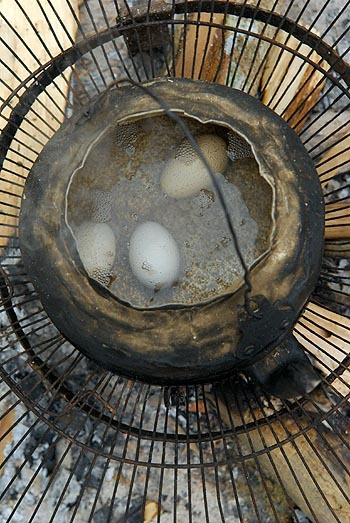 Just three eggs in an old blackened kettle, set to boil over an outdoor fire in Sophoon. When I first saw the kettle from the side, I figured water for tea. Then I peered over the top. Categorized in: Curious food, Etc. This is great! I’ve seen tea in pots, but not eggs in teapots. lol. I’m all for multi-functional cooking equipment, probably because of my tiny kitchen. For example, my husband can’t believe I don’t have a sifter. I just tell him my mesh chinois does the trick (as well as a million other things). Sasha, I agree. My kitchen has very few gadgets. And although I do have a rice cooker, I make my rice the old Asian grandmother’s way: grains in the pot, water up to the knuckle. Works every time. You forgot to note that the cooking grate is the grill from a fan.